Our goal is to make caring for your Land Rover a pleasant experience. We are happy to share our expertise and to offer you quick professional parts support, whenever your Land Rover needs arise. Your satisfaction is important to us. We value your business and will make every effort to make you feel completely satisfied when dealing with us. We take great pride in our extensive on-hand inventory. Rovers North only offers the highest quality parts and accessories, both Land Rover Genuine Parts, and ProLine, our own hand selected line of alternative Land Rover parts. So, if you own a Land Rover, Defender, Discovery or Range Rover and are considering doing more of your own maintenance, or you deal with an independent work shop, get to know our printed catalogs or online website, it will help you understand all the related parts needed for service requirements. We trust you will find our printed catalogs, website and most of all, our staff very helpful when it comes to getting the most in parts support for your Land Rover. All parts and accessories sold by Rovers North are guaranteed to be free from defects for 12 months, unlimited mileage to the original purchaser. Should you suspect a defective part, please return the part with a properly filled out return and exchange form, a copy of the invoice and an explanation of the problem. WE WILL NOT ACCEPT YOUR RETURN WITHOUT THIS INFORMATION. If the part(s) is defective upon inspection, we will promptly send you a replacement at no charge. Please understand that this guarantee is limited to the part we sold you and does not cover any labor or other parts associated with the defective part - no exceptions. Should you or Rovers North make a mistake and you receive the wrong part, please call us immediately so we can send you the correct part as soon as possible. If it is our mistake, we will pay the additional shipping. We will process your order as soon as we receive it. Phone orders for in-stock items taken by 3:00 pm EST are shipped the same day. Website orders placed by 1:00pm EST are normally shipped the same day (for urgent Website orders that require same day shipping we strongly recommend you call to confirm product availability for same day shipping, or place your order entirely by telephone). Orders placed outside of the USA and Canada require prepayment, a Rovers North Sales Team representative will contact you regarding payment and shipping amounts. When calling Rovers North, we have an 800 number and an 802 number. The 800 number is for ordering parts, and this includes all our professional advice to go with it. Our 802 number is for when you are in the thick of it, and you need professional advice on how to diagnose or repair something in detail. You can also use our BBS Forum for technical advise. If you call, please have your VIN (vehicle identification number) on hand. We will make every effort to supply you with correct parts, so please take a moment and look at our Vehicle Identification Pages so you can always have your Land Rover details. Special order parts are always welcome. First time customers will require a deposit. We offer expedited air service or economical ocean freight. Any and all parts offered by Land Rover are available through Rovers North. We make Land Rover ownership affordable with the best prices, quick service, and our unsurpassed 12 month unlimited mileage guarantee. Buy with confidence, we are here to help you. For customers in the United States and Canada we accept Visa, MasterCard, Discover, C.O.D., or Personal Check. All payments must be in U.S. dollars. Personal Check orders will be held 10 days or until the check clears or bank. In the event that your check is returned unpaid for insuffient or uncollected funds, we may re-present your check electronically. Returned checks will be subject to a $25 handling charge or maximum allowable by law, whichever is less. Orders placed outside the United States and Canada require prepayment, a Rovers North Sales Team Representative will contact you for payment and shipping amounts. If you are outside the United States and Canada and would like an estimate prior to placing an order, please contact us first. COD: All payments must be made in Money Orders or Cashier's Checks (US dollars). COD orders must be delivered to an address where you can pay and sign for your order. All prices are subject to change without prior notice. However, we will notify you of any price increase before shipment. After this time, your order will be shipped the next business day. We ship standard ground unless you prefer another method. We offer regular ground, 3 day select, 2nd day air and next day air for overnight delivery. Larger items will be shipped via truck freight. For orders outside the U.S. and Canada please contact us for the best shipping method. We will make every effort to pick, pack, and ship your order as economically as possible. 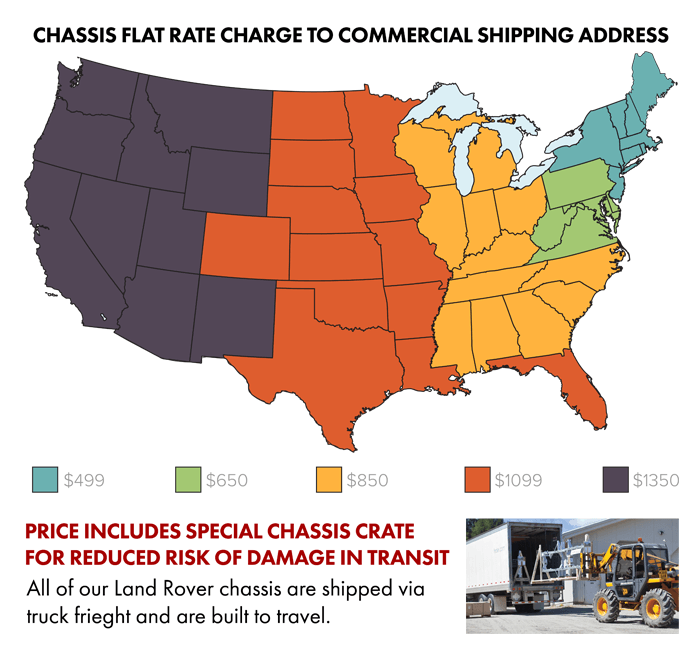 Flat Rate Chassis Shipping Zones. Prices per chassis. For metropolitan areas, peninsulas, remote areas, and other extenuating circumstances we reserve the right to ship chassis via a quote instead of the standard shipping chart. It is important to inspect your package immediately upon receiving it. Should you receive a damaged package, a claim must be submitted immediately with the carrier. If the carrier was UPS, their toll free number is 1-800-742-5877. Do not send the package back to Rovers North. 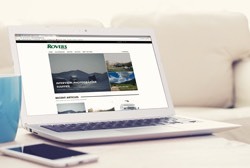 A parts return and exchange form is included with each Rovers North invoice. To return a part to Rovers North, you must fill out the return and exchange form and include a copy of the invoice with the parts you are returning. If you receive a package from Rovers North, and it appears damaged, DO NOT SIGN FOR THE DAMAGED PACKAGE. Any part can be returned to Rovers North for any reason without prior authorization up to 30 days after an order is received, with no restocking fee, except Special Order Parts* ordered per customer request. Parts returned after 30 are subject to a 20% restocking fee, after 90 days are subject to a 40% restocking fee, products returned after one year are subject to 50% placed on account only - no exceptions. Please allow up to a minimum of 14 days for your return to be completely processed. *Special Order Parts are non-returnable unless defective. Depending on the item, a 50% deposit may be required when ordering. Our website should always have the most up to date policies and pricing.